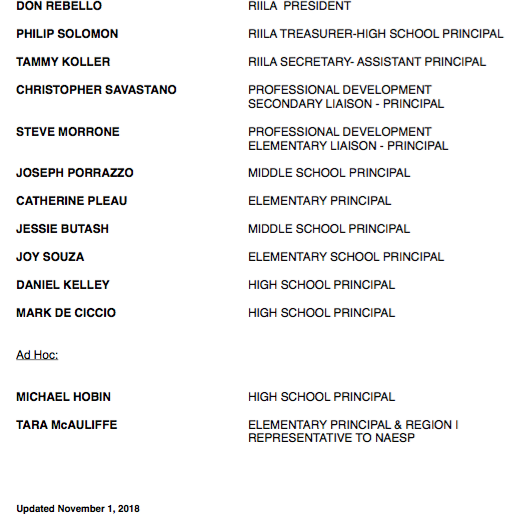 The Rhode Island Instructional Leadership Academy (RIILA) is a 501(c)(3) non-profit organization, created in 2005 to serve as the professional development arm of the Rhode Island Association of School Principals. The Academy's mission is to develop and support Rhode Island school leaders in building strong school learning communities that foster high achievement for all students. The Academy's vision is to provide collaborative professional development experiences for Rhode Island school leaders to enhance student achievement and close achievement gaps within and between schools. Meetings are held monthly 4:00pm - 5:30pm.